What happened: George Springer and Carlos Correa both hit solo home runs and the Houston Astros beat the Seattle Mariners 3-0 in the 2017 season opener on Monday in Houston. 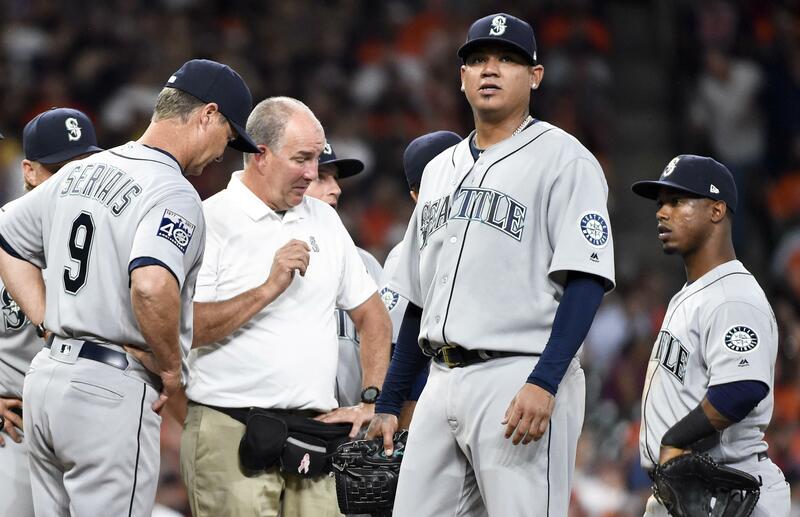 In a potentially bigger development than the opening day loss, starter Felix Hernandez was forced to leave the game after the fifth inning with what the team described as a “tight groin muscle” after a close play at first base. After the game, manager Scott Servais said he anticipated that Hernandez would make his next start. Houston’s Josh Reddick hit a soft grounder to first and Hernandez covered the bag for the out. Hernandez seemed to hit the bag hard and came up limping after the play. Trainers came out for a chat and after a couple of tosses he kept going, but continued to limp. Hernandez pitched a scoreless fifth but was seen in the dugout after in animated discussion with trainers while holding his left leg up. Nick Vincent replaced him for the sixth and he promptly gave up a run. The Mariners put runners at second and third with two outs in eighth, but the rally ended with Cano’s hard liner caught by Springer in right over his head. Shortstop Jean Segura bounced a 1-0 pitch up the middle and picked up his first Mariners base hit in the top of the first. He went to second on a groundout by Robinson Cano but was stranded when Nelson Cruz bounced to first to end the inning. Still, nice to see the leadoff hitter get on in the first on Opening Day. George Springer’s solo homer in the bottom of the inning was a center-cut 91 mph fastball that didn’t move. Control and command are two different commodities. Hernandez threw a strike (control), but not where he wanted (command). Obviously, Felix doesn’t have the juice to live there anymore. The called third strike to Leonys Martin in the second was a nasty, and borderline low, two-seamer. Martin and home plate umpire Jeff Nelson had an exchange of ideas during the break. Astros outfielder Josh Reddick hit a flare that dropped in to left in the second, but Felix got Yuli Gurriel to ground into inning-ending 6-4-3 double play on a 1-2 four-seamer. Keuchel – a three-time Gold Glove winner – made an excellent bare-handed pickup of Segura’s bid for a bunt hit in the third and his throw barely beat the speedy runner to the bag. Springer reached in the third on catcher’s interference to put two on with one out when his swing nicked the glove of Mike Zunino. Felix got out of the inning getting Jose Altuve on a good slider. The called third strike to Kyle Seager with two on and one out in the fourth was “borderline,” but doesn’t change the fact that it came after a walk to Cruz. With a lefty on the mound, the M’s need Seager to be better than his .227/.297/.431 he hit against lefties last season, or perhaps they need to back up Cruz with another right-handed bat against southpaws. Carlos Correa’s fourth-inning home run had an exit velocity of 111 mph and traveled a distance of 449 feet. Yeah, it was smoked. Jarrod Dyson made a terrific backhanded running catch in the corner to rob Nori Aoki in the fifth. That’s a ball that goes for extra bases last year. That’s what speed do. James Pazos made an impressive big league debut: 1 1/3 perfect innings on 11 pitches with four groundouts. Getting shut out on Opening Day is a bummer, but the Mariners are going to score runs this season. Dallas Keuchel is just one injury-marred season removed from a Cy Young award, so it’s not like this was someone’s No. 5 starter who blanked the M’s. The bigger problem is Hernandez’ injury and if it lingers. Hero: Jean Segura. M’s leadoff hitter collected two of the team’s three hits on the day. Goat: Leonys Martin. Hitting in the seventh spot in the order, the light-hitting center fielder went 0 for 4 with two strikeouts and four left on base, including stranding Kyle Seager at first in the ninth inning looking at strike three. With six strikeouts, Hernandez moved past Roger Clemens into fifth on the all-time Opening Day list with 73. He has a 1.76 ERA in his 10 Opening Day starts. Hernandez’ fine line: 5 IP, 5 H, 2 ER, 0 BB, 6 K. 65 pitches, 45 strikes. Mariners at Houston Astros on Tuesday at 5:10 p.m. Hisashi Iwakuma (2016: 16-12, 4.12 ERA, 1.327 WHIP) vs. Lance McCullers Jr (2016: 6-5, 3.22 ERA, 1.543 WHIP). The offense was non-existent last night, though there was a late rally snuffed out when Robinson Cano’s eighth-inning liner ended up in George Springer’s glove. … Yes it was ugly, with all that went on, but Larry Stone wants us to remember it’s also just the first of 162 games. They all can't be like this, can they? … With one reliever out on paternity leave, another is happy to have the opportunity. … The M's organization is not cheap. Published: April 3, 2017, 7:57 p.m. Updated: April 3, 2017, 8:30 p.m.